One of the best things about doing this is that you get to experience live music that doesn’t necessarily twitch the antennae. 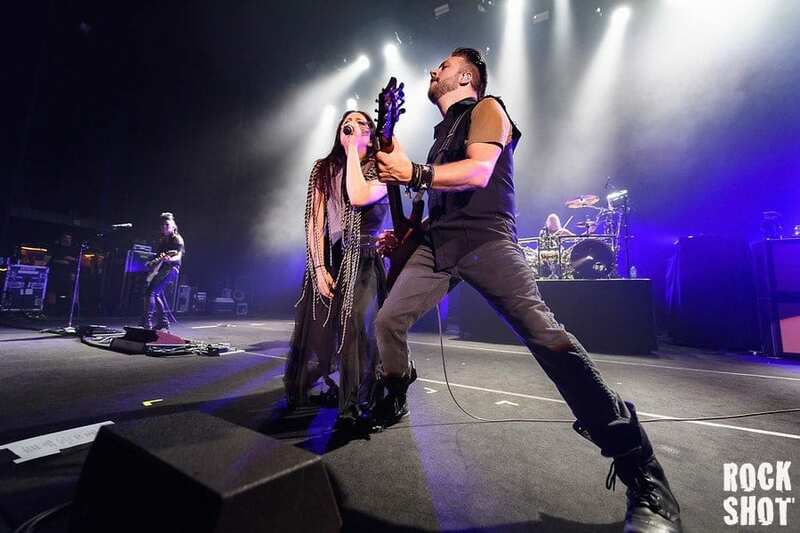 To be honest, it’s unlikely I’d have been mixing it with a sold-out crowd tonight at the Eventim Apollo Hammersmith for an evening with Arkansas rockers Evanescence were it not for the chance to snap them – but I’m very glad I did, on a number of levels. First of all, we got lucky with access right at the front. The band were known in journalistic circles for being a little camera shy on this tour, having previously relegated photographers to the back and indeed we were told to bring something upon which to stand. Net result for me was that I spent the early part of the evening getting weird looks walking about the Odeon with a set of redundant step ladders. It was a price worth paying and our three songs from the front were a blast. Second of all, I did get to see a truly spectacular show. The band have clearly lost little of the energy and passion they brought when their album Fallen established them as superstars in 2003. The number one single that spawned from it, Bring Me To Life, has since become a mainstay of rock radio stations around the world. When you’re not totally familiar with the music (and I’m not), writing about Evanescence is quite tricky. When the band name is 45% vowel, spelling it is even harder. Like most of the developed world, I was of course familiar with Bring Me To Life but I did some homework and listened to the back catalogue ahead of the gig. Wow. Practically every song sounds like it could easily occupy a film soundtrack. At times the band are on the precipice of being too anthemic but fortunately they always manage to stay on the right side of Bonnie Tyler – the line in the sand that you must never, ever cross. Despite my exhaustive research, I did seek to ask some more knowledgeable photographers in the pit what genre the band occupy. I was told ‘Symphonic Metal’ and I’m not going to argue. I know how fiercely prized some of these definitions are. One thing is not in doubt: vocalist Amy Lee is something to behold and as much a signature of this band as Jagger is to the Stones or Freddie was to Queen. Her velvety Mezzo Soprano rang clear around the venue tonight and when she hit those high notes (and she always did), the glassware was in serious peril. The rest of Evanescence were a little anonymous for the most part, save for drummer Will Hunt, whose stick pyrotechnics at the back were sharing the limelight. It wasn’t quite this drummer is at the wrong gig, but it wasn’t far off. After three songs, security escorted the photographers out via a fire exit and having checked my bag and ladders at the cloakroom, I fought my way back in for the rest of the show. Amy was sat centre stage at the world’s fastest moving grand piano performing a sweet, stripped back version of Lithium. Symphonic Metal isn’t just power chords and double kick drums. I had a good chance to survey the audience from the back. It certainly straddled generations but there was no evidence of ‘Dad dragged child’ that I see at a lot of gigs. The pull of this band is clearly far, wide and deep. There wasn’t a lot of interaction with the crowd until a short break mid-set for an acoustic chill out. Two-thirds of the band departed and Amy was joined up front for a sit-down with guitarists Troy McLawhorn and Jen Majura. “I’m sorry, you guys still have to stand up” said Amy shortly before launching into My Immortal, and the crowd participation was immense. Lee, McLawhorn and Majura were joined by bassist Tim McCord and Hunt re-occupied his place behind the kit – but the front four remained planted and the laid-back vibe remained intact for The Change. I was just concluding that nobody bangs their head to symphonic metal when the acoustic set came to an abrupt end with the hammer riff that starts the ironically titled Whisper. It turns out people do bang their head to symphonic metal after all. Not surprisingly, Bring Me To Life closed the main set and not surprisingly, hundreds of mobile phones went up and not surprisingly, that irritated me as it always does. Part way through, Amy encouraged the audience to clap their hands in the air; an act that was a source of conflict to the mobile wavers. At the end, Will Hunt was given the chance he had obviously been craving for the previous ninety minutes to go completely nuts, and then the band walked off. I took this as my cue to leave. I had a long drive, an 0520-alarm call and a set of step ladders to extricate from the cloakroom. By the time I had been repatriated with the car (it was a long walk) and drove around the front of the Odeon, the crowd was only just streaming out across Hammersmith Broadway. It must have been a hell of an encore. The Evanescence In Concert Tour continues now through mainland Europe and a new album, Synthesis (recorded with full orchestra) will be released in the Autumn. Review & Photography by Simon Reed. Evanescence at Eventim Apollo Hammersmith on 14th June 2017.